Roger Federer has confirmed his intention to partner Martina Hingis in mixed doubles for Switzerland at the 2016 Rio Olympics. Speculation has been rife throughout most of 2015 that Hingis, a five-time grand slam champion, had been sounding out her compatriot over teaming up for next year's Games. And Federer, who is the most successful men's player in history with 17 grand slam victories to his name, announced that he has accepted the offer. 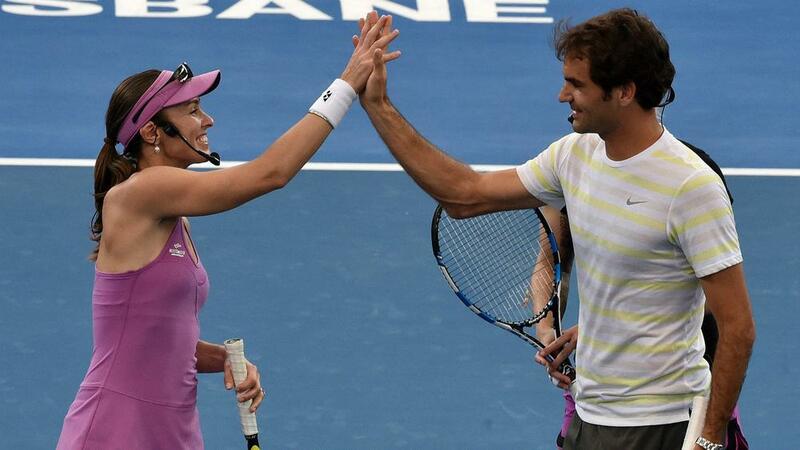 "Yes, I will play with Martina in the mixed," Federer told Sport360. "I'm very excited about that because I haven't played with her I guess in 15 years. "I looked up to her when I was younger, I thought she was the most unbelievable talent. "She's almost my age and she was winning grand slams while I was still at the national tennis centre, trying to make it on the tour and I couldn't believe how good she was. I'm very excited about that." The news means Federer, 34, could feasibly play 15 matches in the space of eight days if he reaches the finals in the singles, mixed doubles, and men's doubles where he will partner Stan Wawrinka. Hingis is second in the WTA doubles rankings and won women's doubles titles at Wimbledon and the US Open with Sania Mirza in 2015. She also won mixed doubles with Leander Paes at the Australian Open, Wimbledon and US Open this year. Last month the 35-year-old somewhat tongue-in-cheek stated that she helped Federer learn how to win titles after the pair were partners in winning the 2001 Hopman Cup, Federer's maiden tournament success.